I am thankful Family Friendly Gaming rented a copy of Ride on the Playstation 4 since the Marketing and PR for Bandai Namco Games failed us to badly. This is a solid motorcycle racing game with plenty of circuits to race. There are also multiple difficulty settings in Ride. It is nice to see Bandai Namco Games redeem themselves after that glitchy Project Cars video game. The kudos probably go more to the developer Milestone. The graphics look good, and the music is nice in Ride. There is some bad language in Ride. I wish they would have left that on the developers table and not included it in the final game. I love the different difficulty settings. I could actually win races using the Very Easy mode in Ride. The rewinds have a limited nature to them in Ride. I wish the rewinds were a bit longer personally. I also wish I could rewind more than once back to back. Those are minor quibbles. I love the brake assist in Ride, as well as the race line. 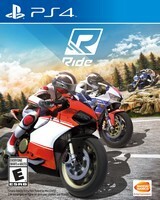 Ride is a solid motorcycle racing game that families can enjoy. I asked that Ride be put on the FFG purchase listing because this is a game I want to play more of. I hope you enjoyed the video capture of Ride on the Playstation 4. I like how it shows I learned the game better, and redeemed myself in the second race. That video capture also shows how long the loading times are in Ride. They are insanely long. Ride does that lame thing of trying to connect to some server once the game comes up. Thankfully we keep the systems disconnected from the Internet since they are such a drain on the expensive Internet plan we have. I did not want to cost Family Friendly Gaming a massive ISP fine for going over the Internet usage plan. I wish more companies would consider that when making games like Ride. The local split screen allows two familiy members to play Ride at the same time.